Turo Pedretti was born in 1896, in Samedan, Switzerland, 12 kilometers from St. Mortiz in the upper Engadine Valley. Turo was born at the turn of the 20th century into an artist family. His father Giuliano Pedretti migrated from Chiavenna, Italy and owned a successful architectural decorative art studio in Samedan. Turo grew up during what many historians have called the most important discovery period in western culture; the flowering of the industrial revolution sparking a mass migration from rural to urban life, from farms to cities. Discoveries in science set the stage for the modern era as well as the contributions of Sigmund Freud and Carl Jung with their research into man's collective unconscience. Fine art swirled with new ideas as the Post Impressionist painters broke from the academies and ventured out on their own to invent modern ways of making paintings. Artists were influenced by all of what was happening in this transition into a modern, futuristic new world. Romantic circles formed in Europe's great cities of Paris, Berlin Zurich, and finally New York. Art movements grew from all of this; the Post Impressionist, Fauvist, the Futurist, Surrealism, Cubism, Da-da, Expressionist and so on, well into middle of the 20th century. Turo would have to grow his identity as an artist during this storm of artistic movements and somehow keep his balance. Turo's father saw in him a true talent with the sensitivity of a fine artist, and encouraged young Turo to pursue painting as a fine artist. Turo's father died when Turo was only 15 years of age. In 1912 Turo's mother fulfilled the promise of the father and enrolled Turo into the Zurich Academy of Fine Art. In 1917 saw Giovanni Giacometti one of Turo's paintings that were on exhibition in the early years of his career and encouraged young Turo to continue to paint freely. In 1923 Turo married Marguerite His, a promising soprano from Basel, and had two sons, Giuliano and Gian as well as a daughter Ladina who became the subject of many of Turo's paintings. Both of Turo's son's became fine artist as well. The Giacometti family became lifelong friends, and were frequent guests in the Pedretti home. Turo made trips into Paris, and the other cultural centers of Europe, and was well aware of all of the various movements of the avantgard. Still, in spite of the allure and excitement of what was going on in the arts Turo kept his balance, he listened to his heart, and had a unique depth of wisdom in his knowing that quality of life was what was most important. And so he stayed in the Engadine valley, and made beautiful, poetic paintings that celebrated his love of daily life in the Alps with his family, his friends, hunting and fishing. In a devastating avalanche of 1951; the majority of Turo Pedretti's early works were destroyed in the home that Turo had built in Samedan. Turo and his son Giuliano barely survived. 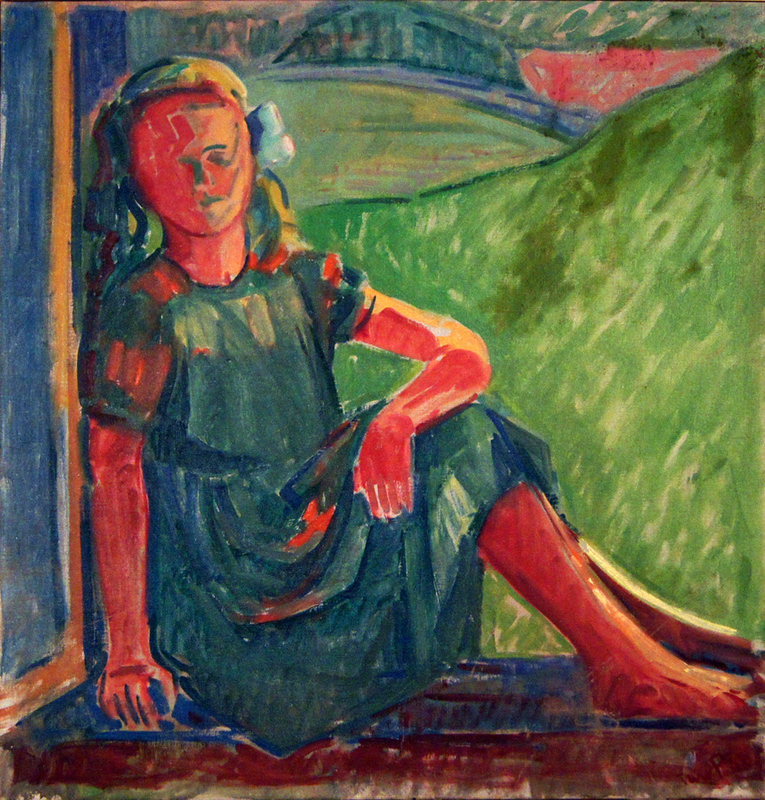 A year later, after relocating the Pedretti home to the neighboring village of Celerina , undaunted by this tragic event, and with a measured influence from the Expressionist and Fauve movements, Turo continued to paint his uniquely vibrant depictions of a beautiful and uncomplicated life. 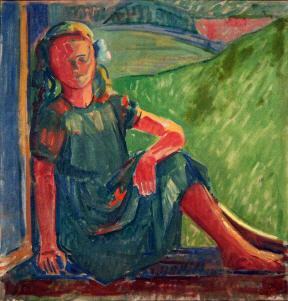 It is true that Turo believed early on that painting should be expressive, and it is therefore not surprising that he would be greatly moved by his seeing an exhibition of Edvard Munch's paintings in 1922. What is significant is that Turo 's conviction that painting should be expressive did not mean that it would be expressive of the dark side of the human experience; as it was with of most of the artists of the Expressionist movement. of a young girl perched on the transition from childhood to her becoming a young women. The painting is a magnificent orchestration of bright green, the green of fresh new grass of early spring, and is a touching expression of a father's contemplation of his daughter. In Turo's painting of, "Cows in Moonlight", expressively brushed cobalt sky and mountains glow the warmth of moonlight casting dramatic shadows. 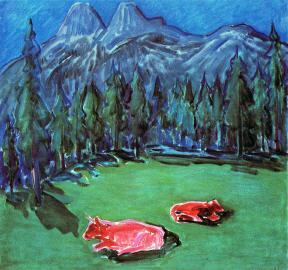 Cadmium red cows sleep peacefully on a turquoise green meadow. The trees are brilliantly balanced with dark, almost black haunting shapes that dance in their place with brushy dark variations of greens, blues and violets. Slivers of crimson red underpainting peek through these colors shaping the forest that frames the meadow like centurions protecting the slumber of the cows. This is a Fauve painting by definition, but without the demonstrative use of arbitrary color that we see in the paintings of Andre Derain as well as other artists from the Fauve movement. Turo was most prudent in how he allowed the influences of the modern movements into his work. Turo Pedretti lived and grew as a fine artist during all of what was going on in the art world, and distinguished himself in a way that is to be greatly admired. He formed his artistic convictions early, and he saw the beauty in life during a most tumultuous time in western history. This is a man who possessed the great gift of knowing himself as an artist. Turo Pedretti's body of work is that of a poetic painter's diary that clearly celebrated the artist's love of his life in the Engadine Valley.